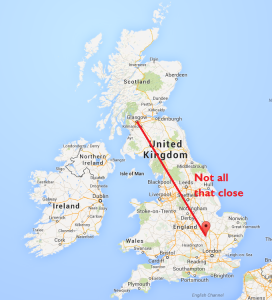 The astute amongst you will realise that Bedford is not all that close to Glasgow. There’s a £20m pot of Department-for-Transport money called the Cycle Safety Fund. It’s available to local authorities to do imaginative things with, providing their idea improves safety for those on bikes. 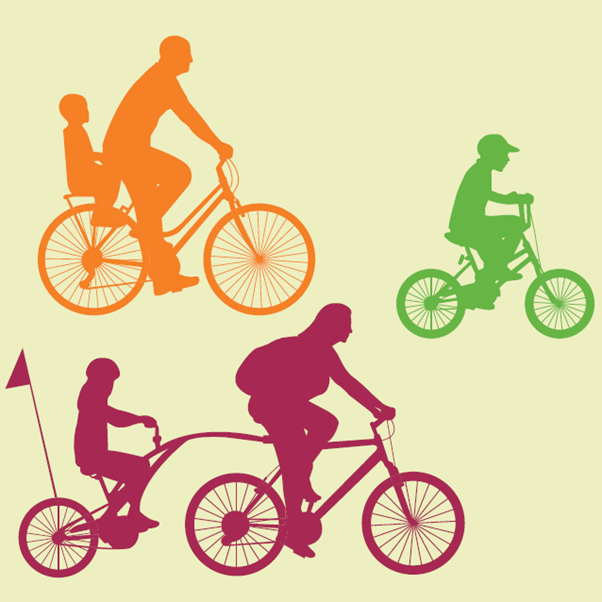 To help the DfT select proposals, they asked Sustrans to manage a panel of cycle ‘experts’, including all the usual suspects like CTC and British Cycling. The last batch of funds was dished out mid-2013. CTC claim the entire process was dodgy, with “worryingly low” ambition in the proposals, a “ludicrously short timeframe” in which winners could spend their cash, and a set of regulations that hamstrung the whole thing. Rather than tell DfT this, the expert panel decided to just approve the best of the bunch. 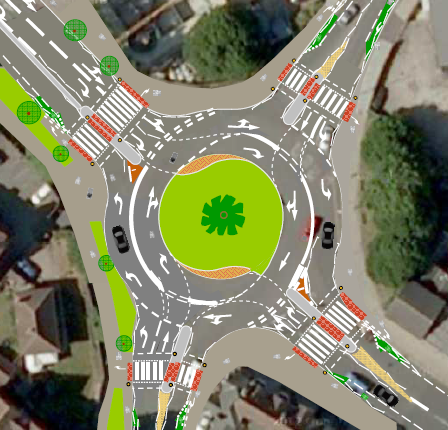 As a result, Bedford got £300,000 to build a Dutch-style ‘turbo roundabout’. As the name suggests, this is a Dutch design not in any way designed to make things safer for cyclists. This has recently come back into the news as Bedford Council revised the design to make it even worse. David Hembrow has written extensively about this, as has The Alternative DfT (who gave the subsequent fallout the inevitable turbogate nickname). Go there for some educated, in-depth opinions and details of who to contact to grumble about all this. Stick with me for a short summary and the odd joke. What’s a turbo roundabout, then? It is a Dutch design, so Bedford council at least got that right. A basic turbo roundabout layout, onto which I’ve expertly drawn some example routes. Original illustration by Juerde, click for info. Turbo roundabouts are intended to guide a lot of motorised traffic through a roundabout at increased average speeds and with fewer conflicts at the entrances and exits. They do this using solid white lines, plastic mandatory lane dividers, and extended islands; forcing users into fixed, spiralling paths. When joining you can be much more confident about the intentions of drivers already on the roundabout, as most of the time they only have one possible option. Therefore joining traffic spends less time stationary waiting for for a gap to merge into. But aren’t all Dutch things great for cyclists? In complete contrast to the UK, the Dutch believe that the only way to safely coordinate high speed cars with slower cycles is to physically separate them. Therefore almost every road will have a parallel cycleway and it is a legal obligation for those on bikes to use those cycleways rather than the main road surface. This works because their cycleways are comprehensive and high quality—in many cases bikes have infrastructure which takes the more direct route at the expense of motorised traffic. In the UK we instead go with a concept called vehicular cycling, where you’re forced into treating your bike like a slow, squishy car. Staying safe means being bold (foolish?) enough to position yourself centrally on many roads and ‘taking the lane’. Turbo roundabouts are used occasionally in the Netherlands to deal with heavy motorised traffic in non-urban environments. Cycles and pedestrians are kept well away. If you think of a turbo roundabout as a motorway, you get the idea. David Henbrow has a series of diagrams on how the Dutch cycleways avoid the turbos here. The Dutch wouldn’t dream of trying to incorporate cycles safely onto a turbo roundabout—it just wouldn’t work. So how is Bedford going to make this work for cyclists? See, Bedford missed the point that turbo roundabouts are safe for cyclists because cyclists are provided with faster, safer alternative routes. Cyclists shouldn’t ever have to use a turbo. Bedford is just going to mix everyone all up together and see what happens. 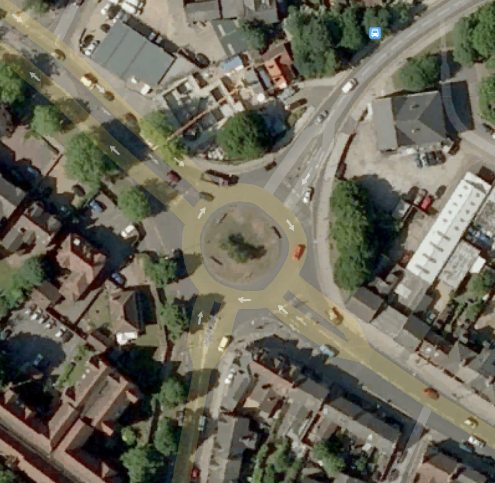 Satellite view of the current Roff Av/A6 roundabout, from Google. 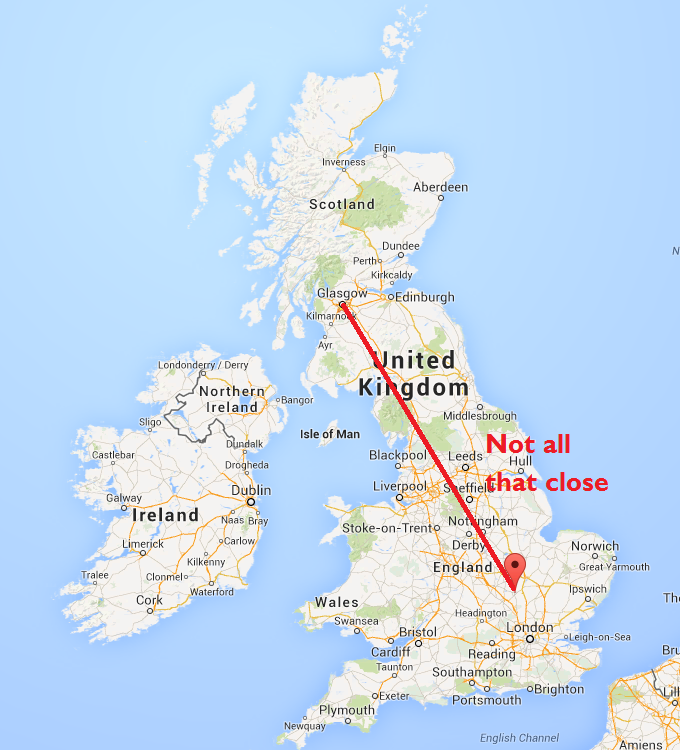 Click for a link to the map. The proposed turbo layout. Note the wide pavements aren’t shared use (which I agree with, mainly because of the nearby school). 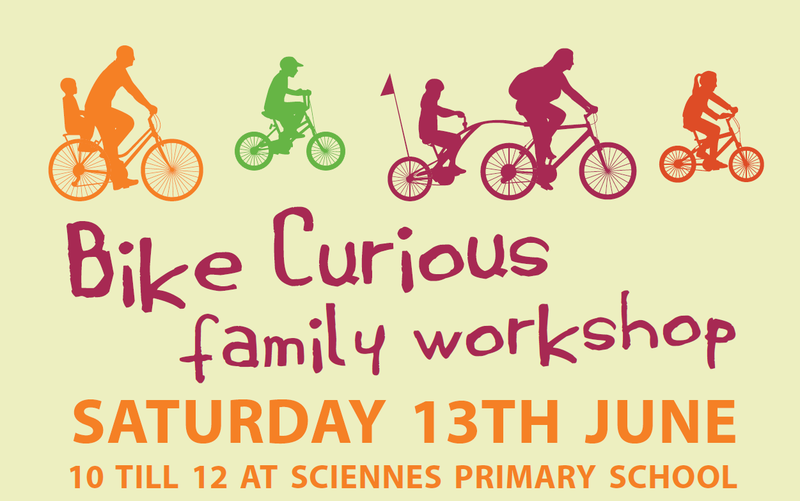 Bikes must use the main carriageway. Image taken from the linked CTC article, but presumably the original is Bedford Councils. Remember I mentioned vehicular cycling above? The designer of the Bedford Turbo (Patrick Longwood) states that “so as long as cyclists are happy to take primary position in front of traffic, they will be safer” (no, really, that’s what he said). If you’re not happy to push out into the centre of the lane, then you’ll eventually get run over. It’s even worse if you’re trying to turn right on a bike. Realising that many cyclists are unwilling to move into the right hand lane of a dual carriageway, we have rule that those riding bikes or horses may stay in the left hand lane and signal right if they intend to continue round the roundabout (rule 187 of the Highway Code). Of course, you can’t do that with this turbo, as the traffic islands force you off. Looks like granny’s going to have to get her girl-racer on and get into that outside lane if she wants to turn right, eh? Why has the council done this? They clearly have a traffic flow problem. This is, after all, the A6. Turbos allow more cars through than a conventional roundabout whilst keeping the occupants safer (at the total expense of non-motorised road users). Because it’s a Dutch design, Bedford can spout nonsense like calling this an innovative new junction that will make a significant improvement to the safety of cyclists, pedestrians and motorists (said here). This gives them access to a few extra pots of money like the Cycle Safety Fund, even though their design doesn’t deserve it. Cheeky? Lazy? Negligent? Your choice! You know me too well… I’ll pick just two. He says goes on to say that the quiet guys can just dismount and walk all the way round the edge (presumably confusing ‘quiet’ with ‘happy to take all day to go anywhere’). You sampled cyclists at the railway station (assuming that’s what station cyclist are), so you probably got mainly commuters. People who cycle day in, day out. They’re pretty confident, and in a hurry either to get to work, or to get home. You only sampled people who already cycle. What about everyone sat at home who would consider cycling, if only the designers would provide them with safe, sensible routes? I cycle every day in Glasgow, so by necessity I’m a vehicular cyclist. I like to think I’m pretty good at it. It doesn’t mean I enjoy sprinting uphill in the outside of the lane with a bus revving behind me. The CTC have been caught out by this in the post they scrambled out to defend their decision to back the design. They state that because cars will be forced to spiral slowly rather than speed straight across the roundabout, everyone will be safer. The problem is that the slower stream of traffic doesn’t stop. Of course it doesn’t—otherwise how could the overall speed through the junction be faster? Turbos deal with high volumes of traffic by creating an endless flow of nose-to-tail, 15 mph cars in all lanes, with none of the usual big gaps for cyclists to aim at. Let’s hope our granny from above gains the ability to instantly accelerate from standing to 15mph, along with her new girl-racer attitude. You mentioned Bedford have revised the design? In response to concerns that motorcyclists might fall over if they tried to drive over the plastic lane dividers, the latest design removes them. So it’s not really a turbo any more anyway. It’s just a big ‘ole roundabout with some psychedelic spirals painted on. Which I’m sure won’t be confusing at all. Good luck, folk of Bedford! Not that many people will read this, but you are confusing less delay with faster speed. Less delay does not mean mtorists will be going faster. It is a common mistake of communication by local road authorities. Many people are confused by the label ‘turbo’ as well. The creators of the design used local vernacular, in this case to describe the spriraling outward design, similar to the blades of a pump, or pinwheel, hence turbo for shape, not turbo for speed. All motorist entering a roundabout, spiral design or not, must give way to those already circulating. Also, depending on the laws where you live, motorists must also yield to pedestrians and cyclists using the walkways and crossing the roads. If you’re having trouble in this area, perhaps enforcement efforts should be stepped up? A C-roundabout from Australia might be more to your liking. While on the locale, Australia has found that cyclist centered in the auto lane are more visible to entering motorists and less likely to be struck as a motorist enters the roundabout (the most common form of cylcist collision at modern roundbouts). Feel free to ignore my post, I’m just an ‘expert’. I’m only too happy to take expert guidance! After all, if only councils et al. would take relevant expert guidance on board when deciding on street design then I’d spend less time blogging and more time cycling. I tried to cover off your points under the last section, where I said that slower point speeds do not automatically make things safer for vulnerable road users. In this case the turbo creates an unbroken stream of traffic that is still travelling too fast for most cyclists to merge safely with. I’ll have a look at C-roundabouts; it’s not a term I’m familiar with. The final point I’d make is that ‘less likely’ to be hit is still little comfort to those that are. There are junction designs that remove the chance of cycle/car collisions entirely. If there is a junction design that removes the chance of collisions (your words), please identify it. I don’t believe such a thing exists. Risk of collision between users can never be eliminated until all users have their own personal pathway. No one can afford such a system. Risk of collision can only be reduced. Severity of collision is a function of speed at impact, and signalised intersections only work insofar as the users follow the rules. 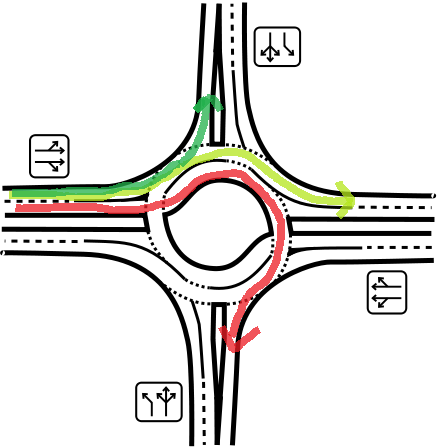 Modern roundabouts employ physics and barriers in conjuction with the rules to achieve safer outcomes. I live in Bedford and have had to negotiate this roundabout several times before, during and after the change of the layout. Incidentally, I drive a car and do not own a bike (much too dangerous – I’m not suicidal). I react to your suggestion that the design is intended to benefit car drivers by using money earmarked for cyclists with hollow laughter, as would most Bedfordians. In the past several years, Bedford Borough Council has put in change after change to the roads of Bedford, and each one has created more congestion than before. They seem to have a pathological hatred of private car drivers (although this is in no way unusual for councils). The end result is that most of Bedford is completely gridlocked every day, including weekends. In the case of this particular roundabout, there was nothing wrong with it before, and as expected the main result has been an increase in delays and congestion. However, whereas the other schemes are just bad, this one is actually evil. When you are exiting the roundabout from certain lanes (possibly the wrong one – who knows?) you are presented with, essentially a kerb that you need to slalom around in a crazy lurch. I have only done this late at night and dread to think what happens in rush hour.